Every music studio needs a website these days, and My Music Staff makes it easy to get one. Choose a template, paste in your text and drag ‘n drop your pages however you want – My Music Staff will do the rest! Sites built using My Music Staff are automatically mobile friendly, so they look great on a PC, tablet or phone! You can also upload files – lesson materials, pictures, songs, movies and even use your own custom domain name. My Music Staff is the easiest way to create a great looking website for your studio, and you don’t even need to be a tech whiz! Image Galleries and Forms are Easy Too! Creating image galleries in My Music Staff is a snap. Just upload your images to the media library, then create a gallery page. There’s no limit to the number of images you include, or how many galleries you can create. Make a gallery for every recital or event you host! My Music Staff also lets you create customized forms on your site. You can create new student sign-up forms, contact forms, student surveys and more. There’s no limit to what you can do! 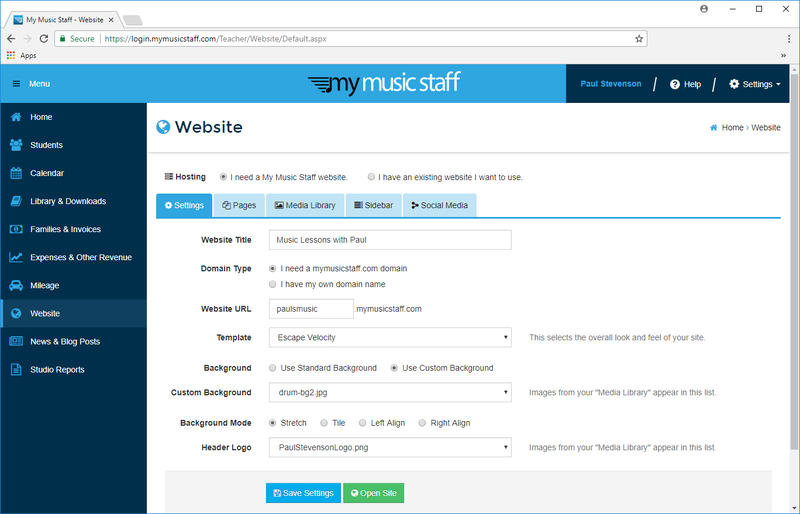 Adding a blog to your My Music Staff website is a fast and easy way to add dynamic content (studio news, studio announcements, etc.) that doesn’t necessarily need its own individual page. 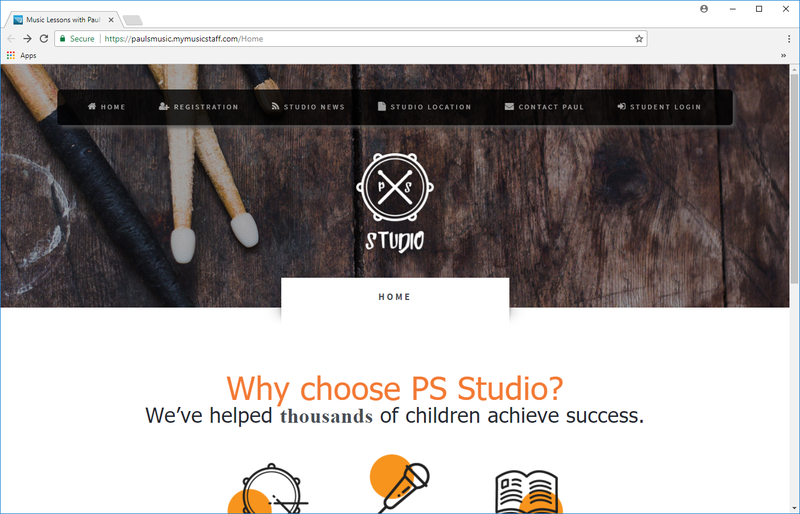 Posts that are created and sent to your studio blog can also be sent to the Student Portal and Teacher Portal (in multi-teacher studios) to be sure no one misses any important announcements or news. Every My Music Staff-built website uses HTTPS so that you and your clients can rest assured that sensitive data is secure. Our HTTPS-encrypted websites will also help your studio achieve better search rankings with Google. Your security is top of mind for us, which keeps customer data safe and helps you connect with even more clients. 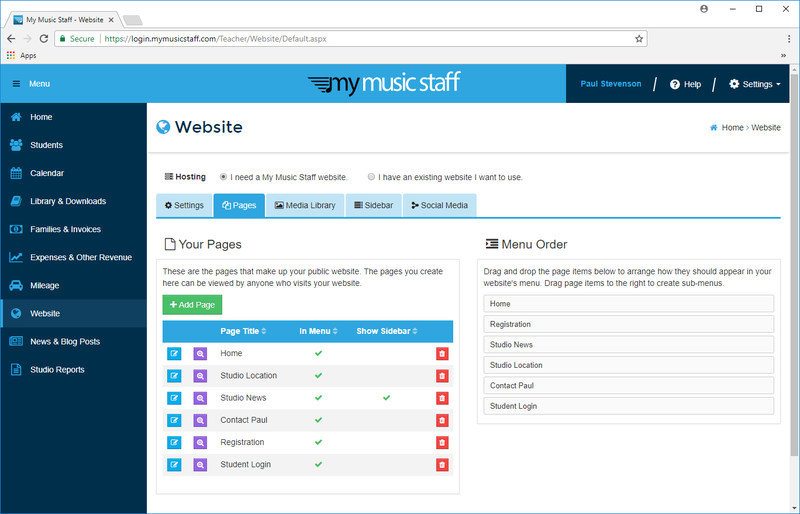 Using the website that comes with your My Music Staff membership is completely optional. If you already have your own website hosted somewhere else, you can keep using it and still take advantage of all the other features and benefits that My Music Staff has to offer, like our Student Portal login and New Student Signup widgets. Click here to learn more.